This 6 Book Set is a collection of must read books. Paperback. 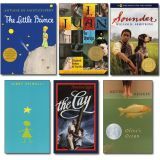 The Cay, The Little Prince, Olive's Ocean, Stargirl, Sounder, and I, Juan de Pareja. 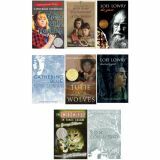 This 6 Book Set is a collection of must read books. Paperback. 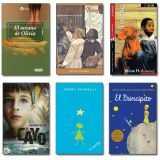 El Cayo, El principito, El océano de Olivia, Stargirl, Trueno, and Yo, Juan de pareja. 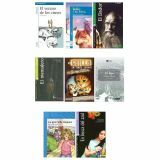 8 Book Set. A collection of must read books. Grade Level: 3-8, Paperback. Includes: The Great Gilly Hopkins, Julie of the Wolves, Son, The Cricket in Times Square, The Giver, Gathering Blu, The Summer of the Swans, and Messenger. 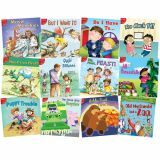 8 Book Set. A collection of must read books. Grade Level: 3-8, Paperback. Includes: La gran Gilly Hopkins, El Dador, El hijo, Un grillo en Times Square, Julie y los lobos, En busca del azul, El verano de los cisnes, and El mensajero. 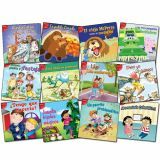 Little Birdie Readers' rich illustrations and engaging stories work together to provide students just enough support as they are learning to read and as they transition of fluent readers. 24 Page. Each book features Words to Know Before you Read and After Reading Activities. 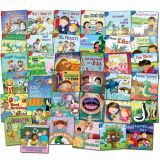 Developed for building confident readers in both English and Spanish! Inside Front Cover Features: Word Count with 100th word; Teaching Focus; Tips on Reading/Inside Back Cover Features: Sight Words; After Reading Questions. Paperback. Titles include: En Sus Marcas, Listos, °Ya!, La Casita Del Árbol, Los Tres Chivitos Y El Ogro, Lagartija Lisa: °El Cielo Se Está Cayendo!, °Paren De Discutir!, Los Problemas Del Intercambio, Zelda La Cenicienta, °Una Serpiente En Tercer Grado!, El Hábitat De Los Murciélagos, El Traje Nuevo Del Rey, Cuentos De Pesca, and Vamos A Acampar. Reading Level: M-Q. 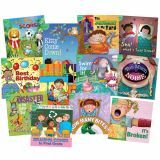 Little Birdie Readers' rich illustrations and engaging stories work together to provide students just enough support as they are learning to read and as they transition of fluent readers. Each book features Words to Know Before you Read and After Reading Activities. 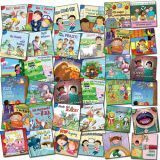 Developed for building confident readers in both English and Spanish! Inside Front Cover Features: Word Count with 100th word; Teaching Focus; Tips on Reading/Inside Back Cover Features: Sight Words; After Reading Questions. Paperback. 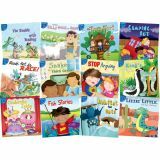 Little Birdie Readers' rich illustrations and engaging stories work together to provide students just enough support as they are learning to read and as they transition of fluent readers. Each book features Words to Know Before you Read and After Reading Activities. 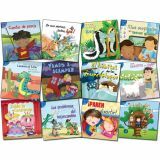 Developed for building confident readers in both English and Spanish! Inside Front Cover Features: Word Count with 100th word; Teaching Focus; Tips on Reading/Inside Back Cover Features: Sight Words; After Reading Questions.